First it's necessary to understand what a Mind Map should consist of. A mindmap is not a web of every single technique and position you have ever seen, drilled, or even pulled off while rolling live. A mindmap is a distillation of your most common actions from your most common positions. 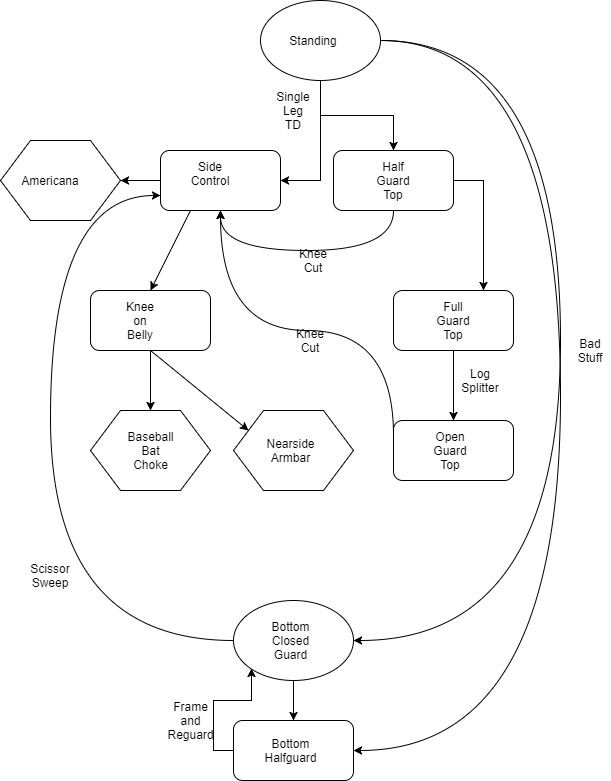 When most people first create a map of their game it's an unreadable mess with dozens of techniques for each position and sub position that obfuscates more than it enlightens, to avoid having your mindmap end up as an impenetrable wall of text there are some guidelines you must follow when making it. Any technique that is in your mindmap should be one that you attempt at least once in the majority of your rolls. It doesn't have to be successful, but it should be something that you are actively pursuing. For most people this will result in two, perhaps three, techniques in a given position. Sometimes as few as a single technique. When you build the map you should build it in a way that generally mimics the flow of a roll. Begin with 'standing' as your base position and proceed with a method for transitioning to the ground, then your sweeps, passes, and submissions, as they derive from that position. If you normally attempt a single leg and your single leg lands you in side control half the time, and in half guard half the time, then you will branch from Standing to those two positions via Single Leg Takedown as the transition. 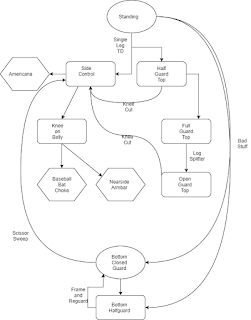 The rest of the map can be constructed in a similar manner following the flow of the roll using the techniques you are most commonly attempting and assuming success or failure. This is a simple map of what a beginners game might look like. So how can this be helpful? 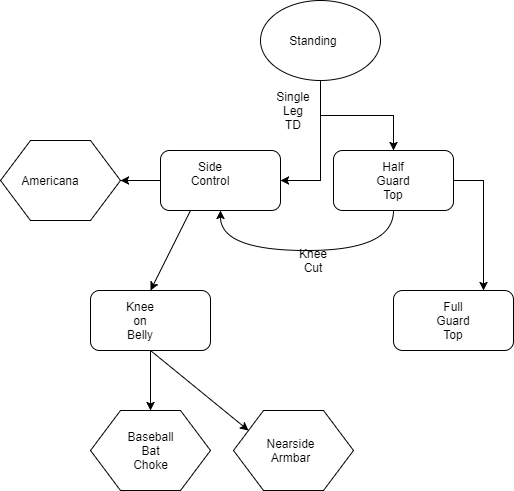 Well, We can see that they favor the single leg and usually land in side control or half guard, the most common path for them is to reach side control and then attack from there or Knee on Belly. Looking at the map makes it immediately obvious that our test subject doesn't really know what to do when they get caught in closed guard. That's an easy and obvious place to address. Our subject will need to learn a guard break and then how to incorporate their existing knee-cut pass into that guard break. We can also immediately see that the focus is on the top game with no consideration for work from guard. Let's fill this out a bit and see what it looks like when we address those two most obvious gaps. Now our subject has filled in their most common response to ending up on the bottom of guard and halfguard. Other bad positions like bottom side control and bottom mount can be largely ignored for this particular exercise because the game plan from those positions is almost exclusively going to be to escape to guard or halfguard, top or bottom. In an actual students mindmap we would fill those in as a matter of course, but they aren't required for this example. So, again, how can this be used in some kind of meaningful and productive way to guide your training in jiujitsu? The first way is to help maintain your focus leading up to competition. It's easy to get bored with doing the same old thing and decide you want to branch out and play with something you saw in a highlight video or at a seminar or that one of your teammates is working on. Referencing your map before training serves as a mental guidepost to the game that you are working on refining. The second way to use the map is to locate gaps in your skills which may not be visible to you in the moment while you are rolling, and can be difficult to pinpoint after the roll when you're exhausted. If you put together your map and get to a point where you don't have a good answer to add to a position then you know that you need to explore that position more mindfully. The third useful activity you can engage in with your mindmap is to looking for links between related techniques which, again, may not be visible in the heat of the moment when rolling. An example would be someone who favors Single Leg X guard and the standard twisting sweep to to take top, and who also favors leg drags for passing vs open guard. It is entirely possible for someone to have been doing both of those things successfully without ever realizing that the sweep they are doing feeds directly into their preferred open guard pass, and instead be attacking the ankle lock even in less than optimal conditions, or transitioning to a less successful pass. Some people will draw those connections in the moment based on the feel of the technique, but for others it takes a conscious thought process of examining the techniques and looking for ways to connect them. 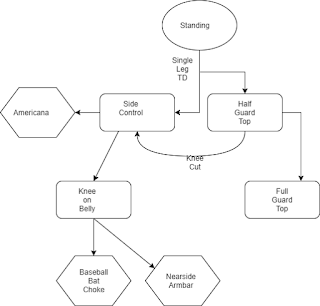 The fourth, and for the me the most common, use of the mindmap is to look for ways to most effectively insert a new technique into your game to shore up a weakness. A good example would be if my preferred finishing position is the back, and until now I have been primarily attacking with armdrags to reach that position I might decide that it would be a good option to add in the berimbolo to provide me an additional path to my preferred position. Adding that technique to the map will keep it fresh on my mind when I consult it before training and remind me to drill it and practice incorporating it into my game. While these four uses are all valuable tools the overall most valuable part of the mind map is the process of creating it and the continual reference to it which forces you to consciously think through your techniques, spend time considering them, and honestly assessing what you do well and often, and what you do not. Over time your map will change as you learn more techniques, replace old ones, add new ones, and expand and refine your game. For me the mindmap is one aspect of an attitude of mindful training which helps me get the most out of each training session and helps me keep a productive focus on the mats without becoming distracted or going too far down the rabbit hole of a new technique that doesn't fit in with the rest of my game. Not everyone will find value in this exercise. Some people will create this once and never look at it again. But for those who do find value in it a well maintained mind map can be a powerful tool for guiding your training and focusing your game.